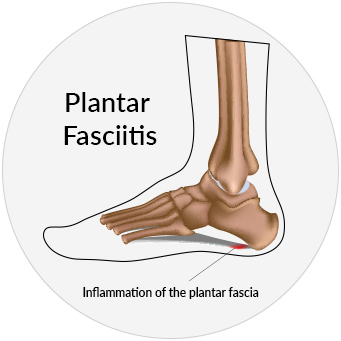 Plantar fasciitis occurs when the plantar fascia ligament (a thick, fibrous band of tissue) that connects your heel bone to your toes becomes inflamed and irritated, resulting in pain in your heel and arch of your foot. Plantar fasciitis is caused by strain put on the plantar fascia ligament, resulting in tiny tears in the ligament. Plantar fasciitis most often causes pain, inflammation and tenderness at the heel of the foot affected. Plantar fasciitis can be treated at home and in a clinical setting. A pt Health physiotherapist will assess your plantar fasciitis. Yes, plantar fasciitis may go away on its own with at home treatments, such as resting your foot, applying cold therapy, and taking pain-relieving medication. However, if your plantar fasciitis is a result of repetitive use or a biomechanical issue (flat feet or high arches), it is likely to reoccur without activity modification. If you have an increased plantar fasciitis risk (your job involves long periods of standing or you have a biomechanical issue), speak to your physiotherapist about your specific therapeutic needs.